Back in March I attended Megalithomania in South Africa and interviewed several speakers. My interview with Andrew Collins became a fascinating discussion on the true nature of reality and how our thoughts affect our lives. Andrew Colins is the well known author of "The Cygnus Mystery". He's a fearless investigator into the unknown. He is also credited as having discovered what is called "the cave of the birds" in Egypt, a site that has yet to be excavated. What was abundantly clear at the end of this interview is that we will need to revisit the questions raised sometime in the future. Andrew Collins (AC): I mean I'm a writer. I'm a researcher and, you know, I can find the information where I need it and when I need it; and in recent times I have been seriously going into quantum science, quantum theory, particularly the work of the theoretical physicist David Bohm, who was onto the whole idea of multidimensional experiences, in connection with the medium that we call plasma. The cutting edge work that is going on at the moment seems to suggest we that might be looking at quite separate life forms existing within plasma environments. Now, where do they come from if they just suddenly exist? Well I think that they are interpenetrating through the plasma from something that's beyond normal space/time, some kind of higher dimensional realm and as I say, this might sound completely, you know, New Age or kooky. It's not. Kerry Cassidy (KC): Hi, I'm Kerry Cassidy from Project Camelot and I am here with Andrew Collins and we are at Megalithomania in South Africa, and I'm very happy to be able to interview Andrew. I have been trying to catch up with him for quite some time and we are going to have some thunderstorm activity in the background, so if you hear some rolling thunder you will know what is going on and it's all good. So what I would like to do here is, Andrew, have you sort of give yourself an introduction and talk about what brought you into this whole subject area, really go back to even your childhood if necessary and give us a little personal background. 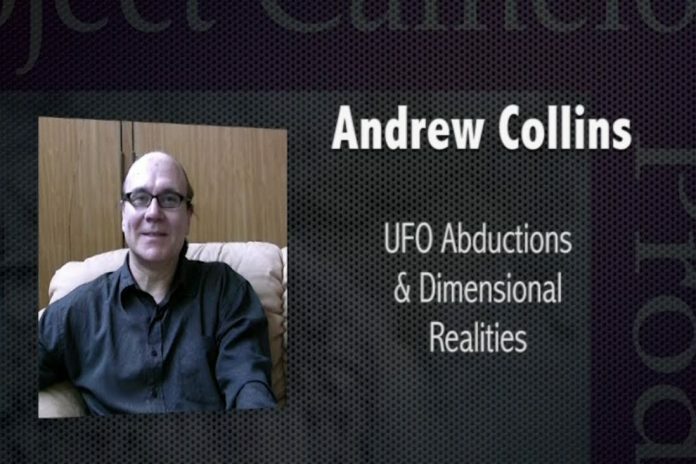 AC: Well, I think I probably began my interest in UFOs when I was a child. I had an interest in aircraft and I saw a strange ball of light in the sky one day, and I thought that this was actually more interesting than the aircraft that I was trying, you know, to view and spot at that time. So I started to read what I could, and as a child there wasn't that much around, and then other interests took over my life and it wasn't until I started work at the age of sixteen that I started gorging paperbacks on UFOs from the likes of Brad Steiger, Jacques Vallee, John Keel, people like this. And, it almost took over my life really, because I wanted to get close to the subject. I wanted to, you know, to communicate with these entities and so I became a UFO investigator with the British UFO Research Association. I started interviewing people that had seen things. And that's where it all began, and very quickly I realized obviously that 90 percent of all UFO sightings have some kind of explanation. But those that didn't were very interested, because the people involved seemed to have certain characteristics which were similar to each other, not just personalities, but they often seemed to be psychic, they often seemed to have physiological traits in common. They would have past lives that were quite similar, and I started to look more at this rather than the actual phenomena itself, because I felt that the people were the key to the phenomena, as much as what they were seeing. And as all this was taking place the type of cases I was covering were getting more and more involved, you know, close encounters at first, close encounters of the second kind, and finally close encounters of the third kind, and even fourth. And until eventually, in 1977, when I was aged 20, I was lucky enough to be put in touch with the first ever witnesses to an abduction in the UK. This was a family by the name of Day, D-A-Y, from West Essex; that's just outside of Greater London, and they were going along a road at night, a short journey, they saw an oval blue light crossing in front of them, and they, you know, they saw this and accepted it as a UFO. It disappeared and they turned the corner and the car headlights failed, they could no longer hear the tyres. The engine failed. And in front of them this luminous bank of green mist, glowing green mist, and they ploughed into that and everything went completely hazy. The next thing they know they are three-quarters of a mile farther along on the road and they get home from this short journey, to find three hours are missing from their lives. The whole case was investigated over about a year, a long period and the standard on board scenario came out during hypnosis, and this really sort of set the standard in the UK. Before that time it was only really foreign cases, like Betty and Barney Hill, and Herb Schrimer 1974, that happened in the USA, plus there were a few really strange cases obviously from South America. And this really primed me, I think. This was at the point where I really started to write about UFOs. And I also realized that there was a paranormal and psychic element here, because the family changed dramatically after the encounter. They became vegetarians, started seeing auras, to see energies out of sight. Also, strange apparitions, tall dark figures seen at night. And I can confirm that this was real, because on more than one occasion, I saw poltergeist activity or heard it, I should say, going on when I was on my own and downstairs one night, sleeping overnight there. KC: You actually went there to investigate. AC: Yes, well I became very close friends with them as well and I am still friends with the man of the family John Day today. There is no question that this event took place and that this… I started to try and get deeper into this because you know the on board experience was quite classic, but there seemed to be some conflicting things going on, because the family had three children. Two of them were asleep in the car. And the third one, when he saw the oval blue light got up and held on to the front seat. And that positioning was the position he was in when he went into the green mist. He was still in that position when they came out. The two other children were still asleep in the back. It was as if time had disappeared completely. So, in other words, it didn't seem as if they had spent three hours somewhere. The whole thing had happened in an instant of time. It's not saying they didn't have an abduction experience. That occurred, but it occurred outside of normal space/time, and this got me thinking that maybe the abduction experiences may be a lot more complex than the simple idea that you've got a "nut and bolts" spacecraft, and somebody goes aboard and then they are put back afterwards. You are dealing here something that is completely out of space and out of time, and that is something that I've tried to get a grip on in various books that I've written, and I'm doing a brand new book now, nearly completed, called "LightQuest", which is all about this very subject. KC: Okay, so, in a sense you are really dealing with dimensions. KC: And I wonder as the result of this whether you have any background in physics, or you know, in other words do you have some kind of background; do you have any military background? AC: No, I have none at all. I mean I'm a writer, I'm a researcher. And, you know, I can find the information where I need it and when I need it. And in recent times I have been seriously going into quantum science, quantum theory, particularly the work of the theoretical physicist David Bohm, who was onto the whole idea of multidimensional experiences, in connection with the medium that we call plasma. And this has been a word has been bandied around in connection with UFOs for a very long time and in fact, it is almost like a "dirty word" within ufology, because, unfortunately it was given as the alternative explanation, like you know: "This is not a real alien encounter, this is a plasma." And people would say: "No it's not." You know, it was almost used in the same way that swamp gas was used to explain will-o'-the wisps and jack-o'-lanterns, the old terms for balls of light in the past. But I do believe it is a key to understanding UFOs and multidimensional experiences. KC: But you're using the notion of plasma. KC: I think when you are talking about plasma you are actually relating to what was the old-fashion notion of the ether. AC: Absolutely, the ether itself is not the manifestation of plasma. I mean, plasma is essentially seas of electrons, excited, giving off protons to create light. These are bound and held together by electrostatic charges and magnetic fields, and they call these buoyant plasmas or plasmoids. Again this is not new, I mean loads of people have suggested this relationship, I think most people accept that they have something to do with UFOs but I'm going further. I'm saying that a lot of abductions or cases — I can't explain all of them of course, no one can — are actually multidimensional experiences where people enter into what I call a "bubble universe". In other words, they get too close to these objects. They first enter what I call a shifted reality, something that Jenny Randles refers to as the "Oz Factor" where everything starts going wobbly and weird around you but you are still in your normal environment. And then at a certain points in the encounter you are just taken completely out of space/time, and if anybody was at that spot inbetween times, they wouldn't see anything, or they might see a light or something like this but they wouldn't see the whole thing. In fact there is a good chance they wouldn't see anything whatsoever. KC: …is that people are taken into, are actually taken into the fourth dimension, literally that particular dimension, which is extremely horizontal. AC: Well that is suggesting that the fourth dimension is a separate place, like the earth, or our physical dimension is a place that exists and you can travel from A to B. I think what you refer to as the fourth dimension is something that is created as and when necessary. In other words, the dimensions beyond the three normal spaces and one of time, unfurl, uncurl into existence when necessary so that the interaction between our consciousness, our mind and other intelligences, which are truly alien in nature create this relationship, and these intelligences use the plasma as a medium for this interaction, this interpenetration into our physical world, and yes, absolutely, the witnesses, the victims, the contactees are taken into this fourth dimension realm where the actual event takes place. I mean, Travis Walton in 1975, logger, in southern United States, comes too close to an object, gets zapped, disappears for a period of days, ah, eventually is found wondering about. His memory of actually being away lasts no more than a couple of hours at the most, and this was a great mystery which to this day, he can't understand. Because where was he for the rest of that time? And I think the answer is, well he was wherever he was because he was outside of normal space/time so time is not running in the same way. There is something different going on here. He is in a created realm, a created environment, which is based on his own mind the knowledge the intelligences have and something inbetween which probably draws from the collective unconscious. You know what we have today, these UFO encounters, alien abductions; what we had in the past was fairy encounters, or if you are a Christian, you know, trips to paradise, visions of Jesus Christ, or even other occasions perhaps even being dragged down to Hell and being tortured by demons. Some of the accounts of that are very, very similar to what we call alien abductions today. KC: Okay, but, I mean there are a number of questions I have as the result of what you are saying. KC: …and the Sumerian tablets all relate to a race that came from the stars. AC: According to Zecharia Sitchin of course. I mean I have to be totally honest. I am not a big fan of Zecharia Sitchin and his interpretation of the ancient texts. AC: Yes. My idea of the Anunnaki are completely separate. I wrote a book in 1996 called From the Ashes of Angels, where I read the ancient texts or at least read all the translations that were available at that time. I mean we are not talking about the modern, boring state ones, but ones from the past, 1910, the 1920s; I've got all of the original material. I even learned Hebrew so that I could read these and read all the characters. These talk about the Anunnaki being virtually a physical race of individuals, let's call them that, that existed in a physical sense and it says that they lived in a mountain-like retreat, something like a kibbutz of Israeli, you know, traditions today, and that they were removed from the mortal world, but they would interact with it. And this world was seen to be somewhere in the North. It was a place where the Cedar forests were and although they are most obviously associated with Lebanon today. However, there were huge Cedar forests to the north of the area where Sumer and Akkad, Babylon and Syria, and this was the area of the Taurus Mountains. And this is the area where Gobekli Tepe is in South East Turkey. The Gobekli Tepe being the oldest known temple complex in the world. From my research, I concluded that the Anunnaki was another name for these individuals called the Watchers of The Book of Enoch, whose offspring was the Nephilim, and that these two, these same incredible beings of flesh and blood that existed in the past and were said to have been giving the arts and sciences of Heaven to humankind. AC: To me these guys were born on this earth. KC: But what about the line that says they came from the planet called Nibiru. AC: Well that's again the work of Zecharia Sitchin. Now, Zecharia Sitchin died last year, there is a lot coming out to suggest that some of his translations of the actual texts are not as they should be and I read The Twelfth Planet, which is a great book, directly after I finished work on From the Ashes of Angels, it gets a very brief mention at the end of it, and in my opinion, his translation of the same texts that I had been looking at were completely wrong. AC: And you know that's a personal opinion, but I happen to know that a various of my colleagues share that opinion. AC: They also look at those. In other words, they [the texts] don't talk about the Anunnaki coming from other planets. You know, they talk about them as a race, as a community of beings, which appear to be flesh and blood, or appear to be immortal. Now what immortal means is up to the individual. I see it as a living across generations at a time when most other people would probably have had a life span of maybe 30 or 40, perhaps these guys lived for a hundred [years], same as we do today or maybe be even longer. Obviously, there are a lot of traditions to do with Biblical figures, patriarchs, living across hundreds of years. Perhaps that's what these guys were doing, they were immortals, but I believe myself that they were flesh and blood. KC: Okay, and would you acknowledge that they were also very, very tall? AC: Absolutely. I mean, all of the texts suggest, you know, they talk about them as tall as trees, giants, and certainly their offspring were giants. And what that obviously means is that, you know, as far as human offspring, they were large sized, and there are some quite disturbing stories about women having to undergo caesarean sections, to remove the babies, because, you know, their birth canals were just too narrow for the child to come out. KC: Okay, what about Akhenaten and Nefertiti and the notion that they might have been from another planet? AC: Yes, unfortunately I studied… I can't really handle, I mean the original ideas for this probably come from the fact that they are depicted with extremely long faces. And this same idea of long faces is there with the Watchers as related in the Book of Enoch. KC: But it's more than long faces. It is an elongated skull. KC: Yes, they have found skulls like that. AC: Yes they have. Yes, well for the most part those skulls are deformed, using bands on a child, on a babe and a child, when they are young. This is a practice that was going on all the way around the world, in the ancient world and in the Americas, certainly from as far back as any knowledge we have, you know, of human civilization. Right the way through and, in fact, I think it still goes on among certain tribal cultures even today. Of course we have all seen these great skulls from places like Peru and Mexico, but it was also going on in the ancient Near East, the very area where I suggested the Watchers and Anunnaki were. Similar skulls have been found there and there are various papers that have been done on them, and what is interesting is that although the skulls have definitely been bound in the same way as a lot of other deformed skulls that have been found in other parts of the world, what is interesting is that the skulls seem to be elongated anyway. So in other words, all they are doing is accentuating something that is already there. Why would they do that? I think it is because these skulls of the deformation process only went on among an elite, among the shamans and the priests, who themselves were a caste that stretches back many thousands of years and perhaps through interbreeding and the rest of it with other races and peoples, they were beginning to lose their original appearance, an appearance which even themselves, they saw in terms of extremely odd skulls. I find this really interesting because this matches exactly the descriptions as given of the Watchers. And the great line in one of the Enochian texts was that their face, or their visage actually it sort of says in one translation, is like that of a viper. What does this mean? Well, think of the Viper Room you know, the great jazz club in the United States. Where did that get its name? Well I'll tell you, and this is what gave me the clue. Because the jazz musicians would play on stage at night, people in the audience, well obviously the musicians would be smoking joints. All of the smoke would completely distort people's faces, and it would make their faces look as if they were extremely long as they were playing trumpets and whatever and it almost seemed as if they were like vipers on stage because their faces. It was this piece of information that started to tell me what a face like a viper or their description of serpents actually meant, that their whole face was elongated very much like those faces of Akhenaten, very much like those deformed skulls that we see. Now I can't explain every deformed skull of course. I mean, I've seen pictures of some very peculiar ones so I would not like to say that every single one has got an obvious explanation. Some are obviously medical conditions and others I can't explain, but definitely, around the world, [bands] have been bound [around] children['s heads] and they have turned out to be very strange looking individuals. KC: …And you are also talking about, you know, because we have massive amounts of evidence that there are "nuts and bolts" craft, okay? KC: …That have been photographed and that are visiting and that are also being reversed engineered by our secret government, and used and so on and so forth. But beyond that it is very interesting the level of multidimensionality that enters into the experience with these other beings, whether… where you think they came from? I'm not sure but in other words, they've got to come from somewhere, okay? KC: So, and I hope that you are not just positing that they come from the human unconscious. AC: No, not at all. Because, I mean, let's get back to plasma. Plasma is a medium, just as in the same way we need air to breathe, I think that certain intelligences that manifest need plasma to exist. And I say this in the knowledge that a lot of work into plasma and physics, the cutting edge work that's going on at the moment seems to suggest that we might be looking at quite separate life forms existing within plasma environments. Now where did they come from, if they suddenly just exist? Well, I think that they are interpenetrating through the plasma from something that is beyond normal space/time, some kind of high dimensional realm, and as I say this might sound, you know, completely New Age or kooky, but it's not. This is exactly what theoretical physicists are suggesting. David Bohm's work is absolutely crucial to understanding this, but more than this, I mean going all the way back to people like Nikola Tesla, he also was seeing intelligences associated with what he would see as electricity, [and] we would call is plasma today. It's a medium. It's merely a medium. But of course then we've got what we call 'entanglement' in quantum theory, the idea that particles can be linked both through space and time, you know, at any distance, you know that if they split apart they can retain instantaneous contact. This isn't just single particles. We are talking about an infinite amount of particles everywhere all the time and this not only is the explanation behind things like telepathy, maybe mind over matter, teleportation, possibly even the future of computing, there are now you know quantum computers based on entanglement on non-localities, non local communication but it's also the means by which life forms can travel from one environment to another, I mean if you've got plasma, plasma only exists at the temporary level I mean if you've got a ball of light or an oval of light or whatever, come into existence you say: "Well, ok, I can accept that there's intelligeable, where does that intelligence goes when the light goes out?" Well the idea is that it withdraws back into a more implicate, or hidden realm. What you call the ether, the ancient Greeks called the plenum and that here it can move instantaneously and then inhabit new plasma environments. Now quite clearly this could be local to the other one that's just gone out like two, you know, like one light goes out, another one comes on, it's the same intelligence or quite clearly it could be on the other side of the universe and backwards and forwards in time. Beyond our own concepts of space/time, anything can happen anything can be going on. Our mind can influence the past, the past can influence us, we can influence the future, the future can influence us, That's time. But what can also happen in space, if we can influence space, both in the forwards and backwards in the same way, that relationship can be with intelligences anywhere in the universe. So when we're talking about these life forms existing within, these plasmas, it doesn't mean that they are of the earth, they could be of the earth, maybe there are those that are local to us but equally they could come from the opposite end of the universe, possibly from parallel realms, as you suggested. AC: Well, that's the here and now. I mean we create our own realities. I mean each one of us has our own reality and that's not just a world view but everything centers, we are like a center spark outwards, the whole of the universe, the whole of space/time for each individual is almost like a point of consciousness so we can influence anything. Whatever we believe can exist. If we believe in lizard headed aliens, they exist. If we believe in alien greys, they exist. If we don't believe in them, we might find out they don't exist but others could introduce us to new evidence that…you know, in other words whatever people want to believe does exist but in a way that worries me slightly because if we can make up reality then what are we bringing into existence with our own physical plane, you know? If we do believe for instance that lizard headed aliens are trying to enslave the human race, can we make that a reality? Can we make that an actual eventuality in this world? I hope not. I hope there is possiblity that we can see UFOs and the intelligences behind them on a much brighter level and perhaps change things. KC: OK, but the trouble is that you know, from the outside listening to you it sounds a little bit too relativistic in the way you're talking. KC:…and I would posit that there is more to realities than simply whether or not we believe in them. AC: But, I mean, it comes back to this key word: entanglement. I mean, if we can influence both space and time, you know I mean who is to say that we can't that some part of us, some part of our mind, some part of our belief can't influence the primeval soup on some other planet a million years ago? And actually cause the creation of life forms a million years ago on another planet that evolves in a certain way so that now in the here and now of our space time it can come looking for its creator, us. It's possible. I mean, you know, these are thought experiments I don't want the viewer to take all this totally seriously but these are new ideas I want to throw around and see where we go. KC: I see. OK, well, fair enough and let me ask you this how do you account for something like the Bermuda triangle? AC: I account for it because there are a lot of cases where the aircraft and ships have just vanished and a colleague of mine, Greg and Lora Little have been looking at a number of the [sites. They] have been going round harbours looking at wrecks and they found a number of the aircraft that classically have gone missing in the Bermuda triangle, they've traced them , they've traced the [serial] numbers, they've had film crews with them and more and more are being discovered, that's alright, that's fine, maybe they got into storms or hurricanes or whatever else and just went missing. Having said this, there are a lot of accounts of some kind of mysterious mist that seems to be luminous that planes, ships seem to go into, experience them. A classic example was in 1904. A ship by the name of The Mohican was travelling from Romania into Philadelphia and about 250 miles offshore, this rolling mist like a large balloon came off the sea. It seems that they've described it as an electric cloud and it enveloped the whole ship and all of the crew found they couldn't move their arms and legs, before that, before this onset they tried to move metal objects and found they were stuck to the deck. The compass just span wildly and the whole of the ship seemed to be alive with like this electric lights, you know like sort of plasma or St Elmo's fire as described classically by a lot of ships crews. And then as quickly as it came after maybe I don't know a short time, 15 minutes, half an hour, it disappeared… it left the ship and everything went back to normal. So what was going on here? Well, these type of clouds, a colleague of mine Jenny Randles has written a whole book called Time Storms and she said, she has done investigations on cases of this all round the world and these are often mistaken, if you like, for UFOs and basically associated with time warps, abduction experiences complete distortions in space and time in exactly the manner that I described of the family from Averly in West Essex. They possibly encountered something like this not exactly the same as this ship that I've been I'm talking about, The Mohican. They went into one of these time storms, if I can use that term. I mean they described it as a luminous bank of green mist or fog or gas and when they went into it all their hairs stood on end, this was exactly what the crew of the Mohican described as well and crops again and again and again with UFO cases. There's no question what this is, it's an electrostatic charge and in plasma environments that's what's necessary to bind together the electron seas. That's what they are, they're contained overall by magnetic fields. But, I mean, don't see this as purely something like physics. All this is a medium for something to manifest through. Something which would be describe as interpenetrating our world. KC: Well this is shown in the movie The Deep. You know the movie The Deep where the water comes up and is actually in the shape of sort of a creature that they see underwater, right? So that's very much a graphic representation of exactly what you are talking about. KC: What I'd like to know is whether or not you are familiar with the Philadelphia Experiment and how you sort of figure that out in terms of what you are talking about. How do you correlate that? AC: Well I think…I mean, I loved the story of the Philadelphia Expermiment. I read Charles Berlitz' book and was it William Moore, I believe, was the other co-author. I've read about it in notebooks previously. The main person who spilled the beans on it was a guy called Carlos Allende and he told the story to a UFO writer by the name of Morris K Jessop and it's a famous story. I mean, there is a lot of evidence to suggest that it didn't happen, I'm afraid. Recently a claimed survivor of the vessel, the USS Eldridge, came forward and said: "Yes, I was there, I saw it all." But countering that is the fact that the members of the crew of the USS Eldridge actually have a yearly get-together and they laugh and joke about the whole Philadelphia experiment saying: "It was far more interesting than what we remember." So, it's the case, the verdict is out whether this actually took place. But what I can say is that the story that I've told you about The Mohican was almost certainly the forerunner of the Philadelphia experiment. In fact, some researchers have actually suggested that the whole idea was based on the story of The Mohican from 1904 which I find really fascinating because here you've got almost the same thing going on and I understand from researchers that there may have been even more to this case than was published at the time in newspapers. So even if the Philadelphia experiment turns out to have been a hoax it was possibly based on a very real incident that occurred in 1904. KC: OK, Well are you familiar with the Montauk experiments? KC:…and, we have, there are so many witnesses that are talking about this and the idea is also, has to do with, what progress has been made from there on in regard to what you might call time travel or dealing with shifting timelines and all of this is cutting edge research that's being done at this time. AC: My honest answer to that is that I have absolutely no idea whether the Montauk story is real or not. I'd love to think it was. Maybe parts of it's a hoax, maybe some of it's real. I don't know. All I can say is that it comes back to what I was said earlier about making up your own reality. And I'll say that flippantly, but what I mean by that is that what we buy into, I believe that we can find evidence for and it becomes real. Which is why skeptics exist. I mean, skeptics will basically find evidence to disprove whatever. Of course they will. Whereas those that believe will always find evidence for that theory or idea or story or whatever that has gone on. Which is right, they're both right because as I said, reality is essentially as you make it. It's not all the same. There's not just one reality. I believe we all create our own reality. We're all like cogs in this great system that probably exists beyond space/time and most people assume that those cogs all interlink and all run together, you know, they're all linked at different speeds but basically… What if the cogs are not connected? What if those cogs that are turning are not actually connected? I mean, this is a possiblility. I think that we need to start looking at reality in a different way. What I see through my eyes, what the viewers see through their eyes, what they're viewing now as they look at this interview, that's their personal reality and that's something which I think that they can influence. Some people are going to reject what I say, some people are going to think these are great, cool ideas. But hey, that's what life's about, I think. KC: OK. But there's still a problem in terms of the fact that we have physical entities entering this reality that are not human. AC: Yeah, I've no problem with that. KC:…they still exist independent of your belief. AC: Yes, but the thing is that, as I said, that doesn't mean that if my reality can't impinge on other people, you know. I've just given a lecture about Gobekli Tepe, the oldest temple in the world. I've imposed my ideas on an audience of hundreds. Now those people will go away and check it and some will validate what I said and some will say: "I think you're wrong." But I've just imposed my reality on other people and if people take that in and allow it to become part of their reality then it's real, you know? I mean I think that that's the way things exist. We influence the past, we influence the future, all of these influence us. Who knows what's influencing us at this very moment for the future maybe. KC: Well, that I will agree with. But what I'm wondering is where you draw the line because there is this independent cogs issue, as you were saying, maybe in 3D they appear independent but as you leave this 3D reality, this level of reality there's no doubt whatsoever that there is a link up, that eventually whether you believe in God or whatever you want to call it, there's a leader or there's a source which is probably the best word for it, that it all ultimately comes from. And so there is a link up anyway above this reality so that things like, for example, the tsunami that just happened in Japan, this is happening on this planet to … it also washed in on…I mean, it was threatening my house in theory on the Pacific coast, it didn't get that far but it did get to Santa Cruz harbour and was impacting some of the ships in the harbour there. In other words, this is very real. This is a linked reality, we're experiencing it simultaneously. AC: We can only challenge what is basically unseen. I mean, this word "inevitability" is very important on defining what reality is. It's inevitable that if I go outside into the auditorium I'm going to meet certain people. It's inevitable that one day I'm going to die and that in itself creates the framework of reality: it's inevitable. That which is not inevitable I think can be changed. I mean, for instance if I talked about Nikola Tesla and said that a psychic said to me: "Oh, he had a secret diary." Now, there is a possibility that he didn't keep a secret diary but the sheer fact that a group of people start believing that he did, could, I believe, influence him back in time to start one up. So that when you start looking into evidence for it, you eventually find it and then that will be the confirmation of that reality. KC: OK, that's a very interesting way of looking at reality, for sure. There is no doubt that in some ways the future does influence the past and vice versa and this moment and I assume you do… in some philosophies they would say there is nothing but else but the now, ultimately. That our view of time, future, past and present is actually that linear thing is actually circular and simultaneous so in essence we are always in the now. This philosophy or theory that you are expounding here has every possibility of being true, right. And I've also talked…You know this is probably crazy to even bring into this interview, Jack Sarfatti is a physicist and is quite well known, apparently you know of his work he often talks of the idea that the future influences the present and the past. We had a dialogue on email at one point in which I said that I have a theory that sometimes when I wake up in the morning, that I can tell what that day is going to be like, because I can tell by looking at my face what my reaction to the day was. In other words, it has already happened. The trouble is that in a way it is worrying and disturbing because it starts evoking ideas that all the monsters that we thought existed when we were kids, you know, which worried us when the lights are out. And yet our parents tell us: "No, everything's okay, it's all fine." Maybe they just do exist or can exist on occasions and I think that the Large Hadron Collider, the team behind that announced recently that they would have evidence of higher dimensions within the year. For them to have made that statement, it means that they must have some kind of foundation. You know, in other words, they have already got results. Because otherwise, they might as well say, you know, we're going to bring evidence that the moon is made of green cheese within a year. AC: Clearly they have already got something and when that evidence is presented, then a lot of people are going to be worried about reality, because what scientists tell us could happen when other dimensions come into play is going to make the world very wobbly and it will be up to, you know almost a skeptic to say, you know, "Look, no don't worry, this and that and the other is not going to happen, because you know, although those monsters can exist, they can only exist on special occasions," basically. They will not exist all the time, you know, because reality is the mutable but to be honest, as I said, that word "inevitability" is important. You know, it is inevitable that if I try and run through that wall I'm going to get hurt, and that's it. It's when things are not inevitable that they can be changed. KC: Okay, well I have to say though if you watched Men Who Stare at Goats you know that you can eventually, if you get your mind in the right framework, run through that wall and not be hurt. AC: I think I would probably hurt myself if I tried. KC: So it's not inevitable. AC: Yes. But you see where I'm coming from. It's not just a case of believing you can warp reality. You know, it's a case of doing so in a way, which is un-evitable, you know. In other words, you have to take out the fixed reality to do it. This is what I said about the Tesla thought experiment there. KC: Well you have to also, I would say, there has to be… reality is an agreement, okay. KC: And so that walking through that wall at this moment on this plane that we exist here with this plant and so on and so forth. KC: In other words we are working in this construct. KC: As souls, nonphysical entities that are manifesting here for a purpose in game field that we have agreed upon. And if we decide to change the field itself, that is going to take a lot of us to do, probably. KC: …that will detonate that sort of power [unclear: form], and we are working on changing the consciousness to make that possible. KC: In other words to make peace possible, for example, in this game construct. AC: Yes. Well this why I say that we have to be careful about what we believe, because what we believe can come true. You know, if we believe that the future of the human race will be will be enslaved by this and that aliens, that could well happen. But if we see that the phenomena and the intelligences behind UFOs in a much more positive light, we can change that, because it is not inevitable that we are going to be enslaved yet. So we can change the future. KC: Okay. All right Andrew Collins we are going to have to continue this at a later date, but thank you very much. You are a very interesting individual, and I enjoyed talking with you.